Betsy has a saying for when things really start to get crazy busy. “We feel like chickens on a hot plate”. It comes from old county fair sideshows and of course I have never witnessed such a thing but the visual image is appropriate for how we feel at this point in the season. Part of the problem is that we are short a few “chickens” right now as Joann and Rett are only working a few mornings a week so that they can work on their own farms. Rachel is also here just a few mornings a week until school is out, then she comes on full time. Our newest staff, Will, starts next Monday, I hope he is a fast dancing chicken! That means we have less than half the help we normally have at this time of year. I can tell you that these old chickens are dancing as fast as we can. None the less we are keeping the big balls in the air (and occasionally letting the little balls hit the ground). The inexorable march towards getting the main planting of tomatoes in the ground moves apace. The beds are tilled and ready. Yesterday we pulled the plastic covers over the Big Tops so that tomorrow we can put down irrigation line, lay the landscape fabric mulch and build the 1000′ feet of trellis that will support the plants. Next Monday or Tuesday we will plant the crop, right on schedule. So while we are we are out of control busy the Farm Tour is this weekend too! Saturday and Sunday is the Farm Tour 1:00-5:00 each day. Our annual opening of the doors to the general public to come see the farm. 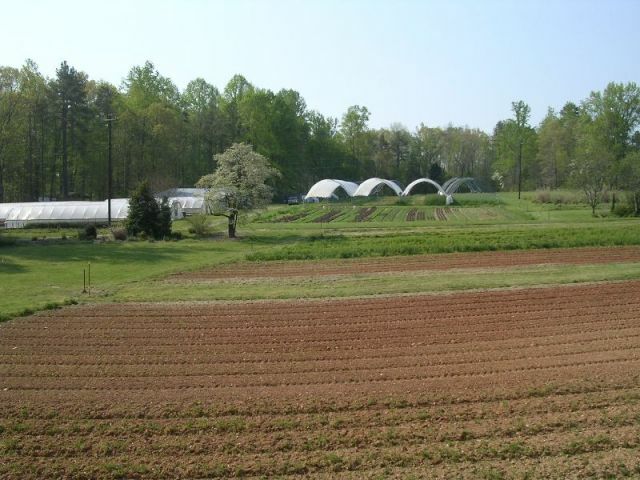 Many of you have been on the Farm Tour before and it is a great opportunity to see many of the folks who sell and the Carrboro Market. Now in it’s eleventh year thousands of people go on the tour and it raises thousands of dollars for the work Carolina Farm Stewardship Association does. Sponsored by Weaver Street Market, who does an incredible amount of work to promote the tour and local agriculture, it is easy to go on the tour. Just pick up a map at market or Weaver St. or many other local businesses and go to first farm that you want. The best deal is to buy a button which will be your pass for as many people as you can stuff into one vehicle, for as many farms as you want. 31 farms this year so you will have to choose, it is hard to do more than 3 maybe 4 farms in a day. In the mean time we will be mowing and picking up around the place, nothing like have hundreds of house guests all at once to make you buff up the joint! Just about the whole top of the farm, the little sliding tunnels on the left, lettuce in the middle and the Big Tops in the back, come and see it all on the tour.